How would being a tentmaker be an advantage to Paul while he was on his missionary journeys? Archaeology provides some possible insights. The picture of the week comes from Volume 11 of the revised and expanded version of the Pictorial Library of Bible Lands which focuses on Greece. The photo is entitled "Corinth Shop on Western Side of Lechaion Road" (photo ID # tb031706129). Click on the photo for a higher resolution. The term translated "tentmakers" could refer to craftsmen who were skilled in all sorts of leatherwork, not just in making tents. As Paul worked alongside Aquila and Priscilla, they may have worked out of a shop such as the one shown in this picture. Here they would have made leather goods, repaired leather items, and also sold their wares to the public. Shops such as this were located along the Lechaion Road in Corinth as well as in the North Market. However, it should be stressed that the exact location of Aquila and Priscilla's shop (assuming they had one) cannot be determined. From a shop in a busy market or giving on to a crowded street Paul had access, not only to co-workers and clients, but also the throng outside. In slack periods he could stand in the door and button-hole those whom he thought might listen .... It is difficult to imagine that his dynamic personality and utter conviction did not quickly make him a 'character' of the neighbourhood, and this would have drawn the curious, not merely the idlers but also those genuinely seeking. In sum, therefore, the workshop was a very astute choice for a missionary center, but it should not be imagined that Paul thereby had it easy. The average artisan of the period barely made ends meet ... and in Paul' case his wandering life made it difficult for him to build up the local reputation that outweighs competition. Long hours of exhausting toil were necessarily his lot, and how many times did he have to start all over again in another small shop in a strange city? This and other photos of Corinth are included in Volume 11 of the Pictorial Library of Bible Lands and can be purchased here. 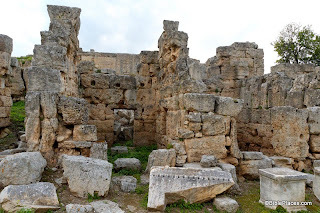 More information on Corinth and additional photos can be found on the BiblePlaces website here. The quotation is taken from Jerome Murphy-O'Connor, St. Paul's Corinth: Texts and Archaeology, Good News Studies, vol. 6 (Wilmington, DE: Michael Glazier, Inc, 1983), 169-170, and can be purchased here.